Look what just arrived on my desk, today. This! Yes, this. 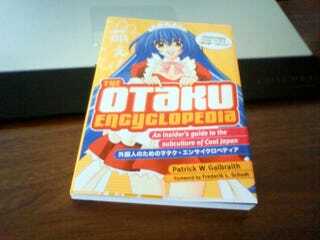 Written by the always insightful Patrick Galbraith, The Otaku Encyclopedia is just that, an otaku encyclopedia. From A-Z, the book covers everything Japanese nerd — an impressive feat. It also features interviews with maids, famous cosplayers, arts like Takashi Murakami, retro game idol Haruna Anno and otaku heroine Shoko Nakagawa. The book is edited by Andrew Lee and published by Kodansha International, which put out my arcade book, Arcade Mania. The Otaku Encyclopedia is out in Japan right this very second and will be available abroad this fall.